PowerDNS is an amazing, feature-rich and versatile DNS server solution. Originally created by PowerDNS.com BV as a commercial product, it was later opened up and licensed under the GPL. Today, it thrives with both commercial and community contributions, making it an outstanding DNS server alternative. DNS, of course, is the distributed, hierarchical naming system that allows us to map what would be IP addresses to much more humanly digestible addresses. Thankfully, we no longer live in the early days of the Arpanet (precursor to today’s Internet), where we had to transfer large host files from node to node. Its compact codebase and focus on security, scalability, and reliability make PowerDNS (PDNS) a great nameserver choice; it is jam packed with features that would impress any network or sys admin (Table 1). PowerDNS has two key distinct components: the authoritative server and the recursor. Other DNS servers combine these roles, but PowerDNS holds them separate, and you can configure PDNS as either option. An authoritative name server is just what it sounds like: It is the original and conclusive source of DNS zone information for a particular domain. A zone is merely a portion or set of administrative space. Authoritative domain servers are of two types: primary and secondary. Primary Name Server . Sometimes called a master server, this is the original and definitive source for all zone records for a domain. Secondary Name Server . Often called a slave server, this server is an identical replica used to provide redundancy and high availability. It goes without saying that providing additional redundancy is vital to a service as critical as DNS. PowerDNS Recursor . The PowerDNS Recursor, on the other hand, simply provides caching or a standalone recursive resolver for clients accessing your network or the greater Internet (i.e., it is your first line of DNS for client machines). Recall that it isn’t authoritative but simply provides query resolution to network client resolvers (client-side portion used to perform DNS queries) on your local machine. Supermaster/Superslave . The supermaster feature set in PowerDNS allows you to automate the provisioning of slaves. Superslaves can configure themselves automatically as a slave for a zone when they receive notification from a known supermaster. PowerDNS has many configuration options – so many, in fact, that someone could easily write an entire book on each. As such, I will limit my coverage herein to its use with a primary server with a MySQL back end with the Poweradmin web GUI. Because of scope constraints and the well-documented nature of the project, I’m sure you will be able to add secondary and tertiary servers as needed. 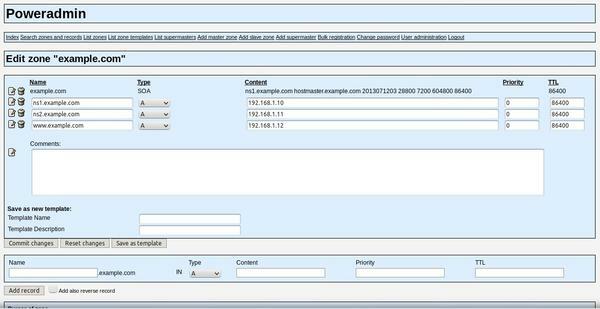 For information on configuring with a BIND back end (i.e., using BIND configuration files), please see my previous article in ADMIN Online on PowerDNS with BIND back end. Be aware that all unattended upgrades are logged in /var/log/unattended-upgrades , so you might want to review it periodically, along with your other logs. Additionally you could do much the same with the commercial, and more feature-rich, Ubuntu Landscape. Now that the base system is set, you can fire up another box and set it up the same way. Redundancy is a must. Like any service as vital as DNS, you should build redundancy into your infrastructure – which means at least two or more of everything – or else you will need much more than two aspirins to deal with headaches caused by downtime. In the case of PowerDNS, that means two or three DNS servers; if you are using a database back end, you should not have a single back end for your entire infrastructure; rather, you should match them up with one back end per PowerDNS server. With your servers up and running, you can now install your packages and configure them. #This is our MySQL password. Please, for the love of all that is sacred, stop using weak passwords! #This details which MySQL database PDNS should use. #Specifies the local IP for PowerDNS to listen on. #This tells PowerDNS to run this as the primary server. This primary server will send out a special notify packet to notify the secondary or slave of updates. Now with a base PowerDNS configuration, you can go about setting up your MySQL back end. Note on MySQL Security . Obviously, you can do much more to secure MySQL, but for the sake of brevity, I don’t include much detail. Like any other application, it deserves some time to improve security from its default install state. Note that I’ve only highlighted the steps that might require some user customization. Obvious steps in the sequence in Figures 1–4 were excluded explicitly. Now you want to give limited rights to Poweradmin so it can update the data in the tables. To do this, you should create a new user and give it rights to select, delete, insert, and update records in the PowerDNS database. In the event you would like to further customize your config file, you can edit this or explore the rest of this application’s subdirectories. 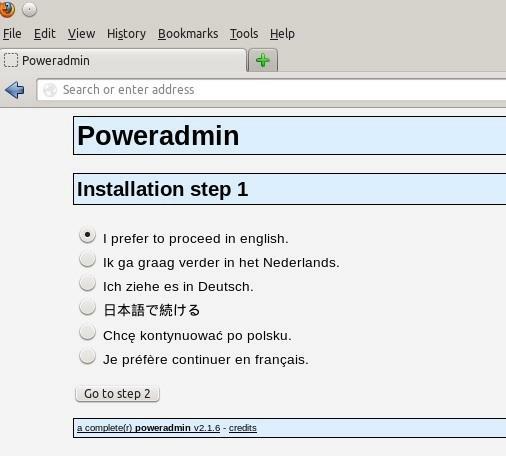 To access your Poweradmin server go to http://primary/Poweradmin/ index.php (Figure 5). 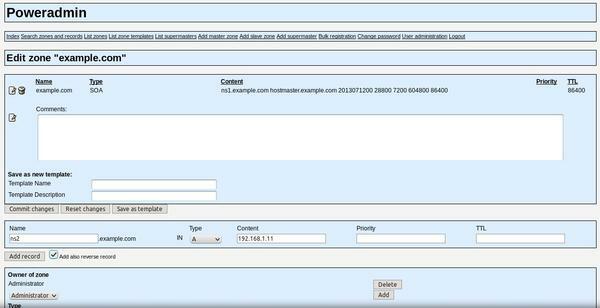 Once there, you should add your master zone by clicking Add master zone from the initial login screen (Figure 5), add the information required for your base domain, and click Add zone (Figure 6) . From here, click on List zones (Figure 7) and then Edit an existing example.com zone, as in Figure 8. As you can see, the GUI is very simple and will guide you through the process of creating your basic required DNS records. Once done, go back to the same domain and add any additional records you would like. DNS is a commonly exploited service that requires you take time in your engineering stages to deploy it properly. Unfortunately, DNS has supernumerary attack vectors. Although the risks to a service as critical to the functioning of your network as DNS are many, you can take some simple steps to ameliorate them. Patch, Patch, Patch . As silly as it sounds, some people don’t believe or invest in automating patch management. If you do so, it will solve quite a few known issues. Split Servers Across Networks . Placing all your DNS servers on a single network space could be highly problematic if that core router dies or if that network comes under a distributed denial of service attack. Split your servers across several properly redundant and fault-tolerant network/server infrastructures. Firewalls . As we all know, firewalls are by no means perfect, but they are still a good practice. Firing up iptables on your DNS box will at the very least add additional layers to keep out those with malicious intent. Besides, thinking about ingress and egress rules with networks services is always a good discipline. Explore and Deploy TSIG/TKEY and DNSSEC. Use transaction signature/transaction key (TSIG/TKEY) for securing zone transfers, and deploy DNSSEC to help protect against cache poisoning. Although not detailed herein for brevity’s sake, I point you to the copious documentation on these features on the project website. I’m a big proponent of thinking of security as a priority in everything I do in Information Technology, and I see a rising consciousness of its importance. When you build with security as step 0, your problem set is dramatically reduced. Now that you have created a primary server and it is up and running, you have more work to do to create true redundancy. As I said before, having any single point of failure (SPOF) is always unwise. To that end, you have a number of ways to create a secondary server, but I’ll leave those for you to explore in your own time and hope you will have fun. I hope this short article has whet your appetite to explore this tremendously performant, feature-rich, flexible DNS software. PowerDNS rocks! Happy Hacking! PowerDNS is a secure, scalable, and reliable DNS server solution licensed under the GPL. We show you how to use BIND master zone configuration files to configure your PowerDNS server and how to create a primary server with a MySQL back end managed by a Poweradmin web GUI.